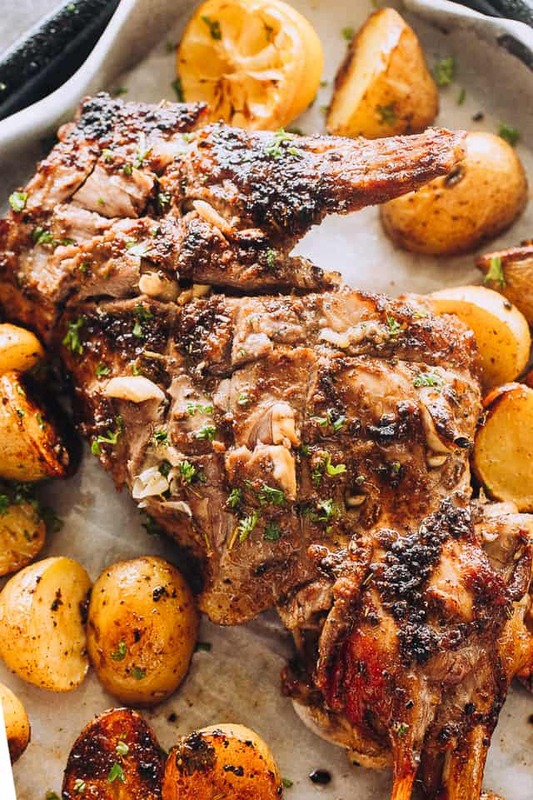 Tender, melt-in-your mouth Roast Leg of Lamb prepared with a succulent and citrusy garlic, herbs, and paprika marinade. A classic Easter lunch with tons of flavor! 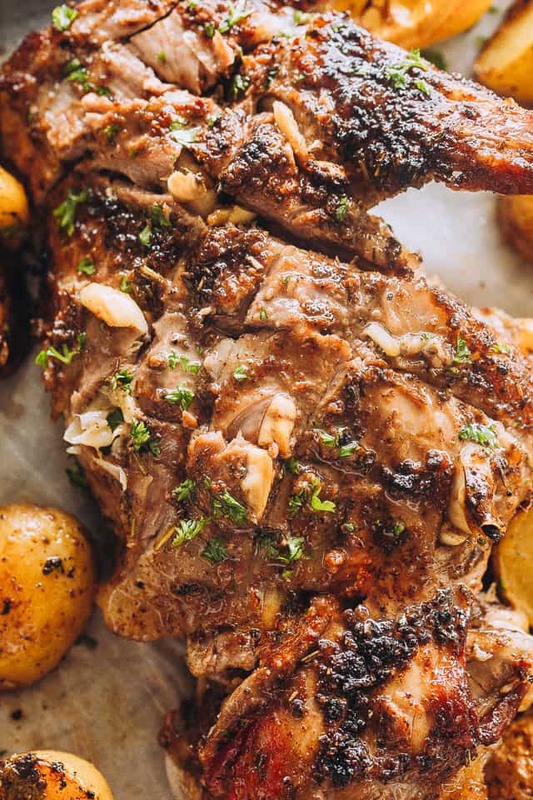 Leg of Lamb marinated overnight and roasted to a juicy, melty, and tender perfection. The pungent spices paired with lemon juice and lots of garlic, offer meltingly soft, flavorful meat perfect for a Holiday crowd. If you want a simple, lean roast lamb that’s crisp on the outside and juicy on the inside, go for a bone-in leg of lamb. When you roast a piece of meat with the bone still in, you are getting all that flavor and then some! 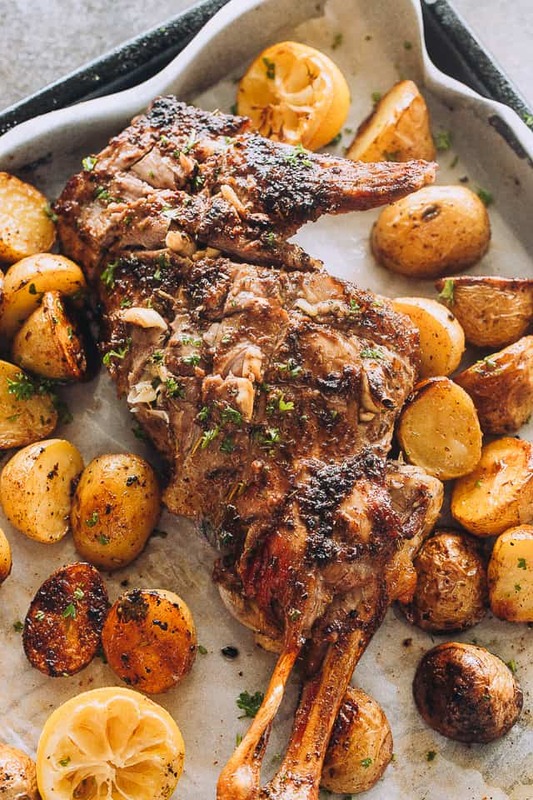 The best part of this Lamb recipe is that it’s very easy to make. 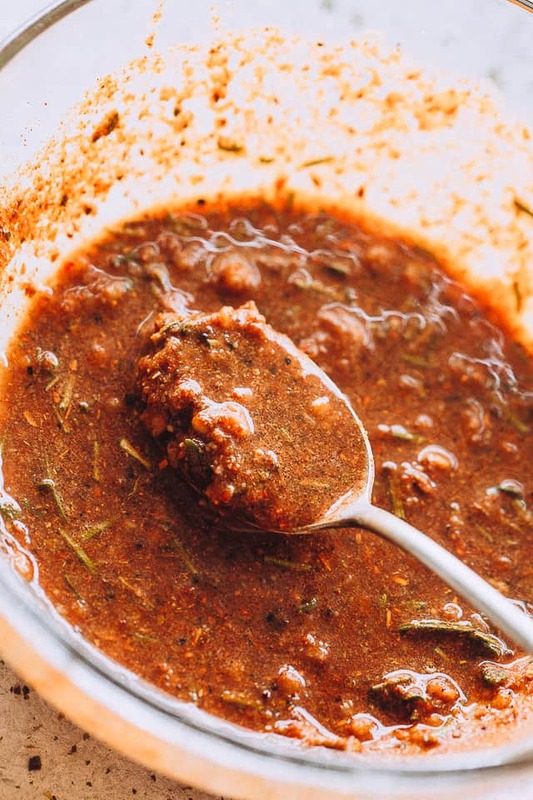 Most of your time is spent on just making the garlic, herb, and paprika paste, which takes all of two minutes. Do not be turned off by the long list of ingredients – it’s just spices, fresh herbs, and garlic. For best, fall-off-the-bone results, you need to start with a robust marinade that will cut through that strong flavor of the lamb. Combine all of these ingredients in a mixing bowl and whisk until fully incorporated. Trim excess fat from leg of lamb and transfer the leg to a roasting pan. Using a knife, make 6 shallow incisions and stuff with a mixture of smashed garlic and fresh herbs. Rub the lamb with the prepared paste/marinade. If the paste is too thick to spread, add a bit more olive oil to thin it out. Cover and set in a cool place for 4 hours, or marinade overnight in the refrigerator. Remove from fridge and let sit on counter for 20 minutes. Roast in a 350F-degrees oven for 1 hour to 1 hour and 15 minutes. Lamb is cooked through when internal temperature reaches 145F. Please use a meat thermometer to ensure correct doneness. Just to note, we always buy organic, grass-fed lamb, and we get it from a local farmer. When it comes to meat, the important points to keep in mind are: the more local, the better; the fresher, the better, and grass-fed lamb is critical for determining the quality of the meat, the health benefits of the meat, and for the humanitarian care of the animal. 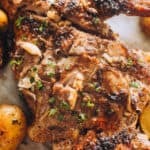 Tender, melt-in-your mouth Roast Leg of Lamb prepared with a succulent and citrusy garlic, herbs, and paprika marinade. Using a knife, make 6 shallow incisions into the leg and set aside. In a small shallow bowl combine 6 cloves garlic, 1/4 teaspoon olive oil, thyme leaves, salt, and pepper; using the back of a fork, press into the garlic to mash it, and stir around to combine it with the rest of the ingredients. If you have a mortar and pestle, use that to make the mixture. Stuff the garlic-herb mixture into the incisions. Set aside. In a mixing bowl combine lemon juice, olive oil, paprika, fresh ground pepper, cumin, cayenne pepper, rosemary, thyme leaves, and minced garlic; mix until thoroughly incorporated. Set aside two tablespoons of the paste. Cover and refrigerate. Use the rest of the paste to rub all over the lamb leg. Sprinkle lemon zest over the leg of lamb. 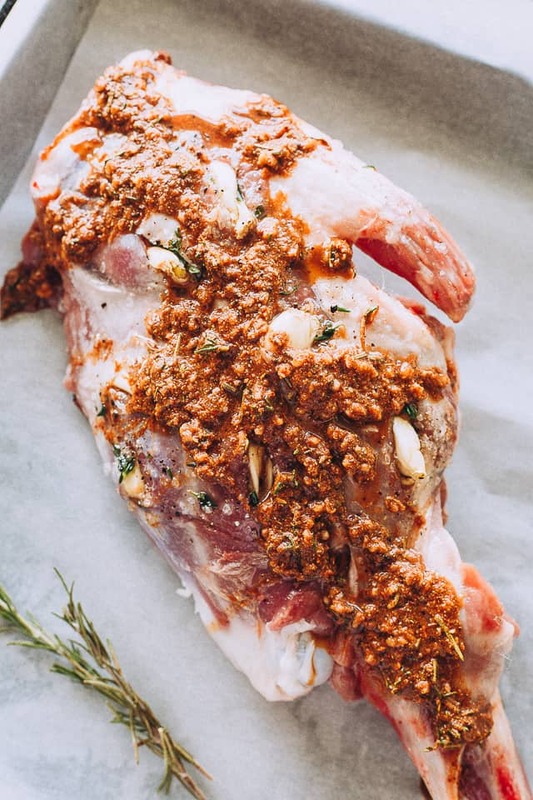 Cover the lamb with foil and let stand 4 hours in a cool place, or overnight in the refrigerator. Remove lamb from fridge and let sit on counter for 20 minutes before cooking. Cut up the potatoes and arrange around the leg of lamb. Drizzle a bit of olive oil over the lamb and the potatoes; toss potatoes to coat. Take the reserved marinade/paste and, using a pastry brush, brush the paste over the potatoes. Sprinkle coarse salt over potatoes and lamb. Roast for 1 hour and 10 minutes, mixing through the potatoes few times during cooking. After 1 hour, check for doneness; Lamb is cooked through at 145F. For medium-rare, remove lamb from oven at 125F. Remove from oven and allow meat to rest 15 to 20 minutes before carving.